The first KC-46A refueling jets may find a home at Fairchild Air Force Base. Air Force officials will visit the four bases and rank them on a set of criteria that include mission, environmental concerns, capacity and cost. They will announce a preferred location for Main Operating Base 1 and reasonable alternatives this spring and conduct environmental impact studies. The Air Force will announce the choice for Base 1 in spring 2014. Fairchild Air Force Base is on the short list to be the first home for the nation’s newest air refueling tanker. The Air Force said Fairchild and three other bases will be studied for the selection of the facility to “bed down” the first KC-46A refueling jets when they roll off the assembly line later this decade. Along with Air Force bases in Kansas, North Dakota and Oklahoma, Fairchild is a finalist to become Main Operating Base 1 for replacements to the KC-135 tanker, which has been a mainstay of the Air Force refueling fleet since the 1950s. As many as 36 of the new refueling jets would be assigned to the base, and the older tankers would be reassigned or retired. Making the short list recognizes hard work by local and state officials and Spokane-area business and civic leaders to lobby for Fairchild’s inclusion, said Sen. Patty Murray. But it’s only the next step, added Murray, who announced the Air Force’s decision along with Sen. Maria Cantwell and Rep. Cathy McMorris Rodgers. “There’s no doubt we all have to work hard together” as the process continues, she said. The KC-46A is built by Boeing, as was the KC-135 it replaces. Col. Brian Newberry, commander of the 92nd Air Refueling Wing at Fairchild, said he looks forward to providing Air Force officials all the information needed to make the best selection for the country and appreciates the support the base has received from the local community. The new aircraft will have a larger fueling capacity, more room for cargo and be better equipped for medical evacuations, Newberry said. It also will be able to take on fuel as well as dispense it and refuel Navy aircraft as well as those from other nations such as Canada. Fairchild has an important mission as the tanker base closest to the Pacific Rim, Murray said. It has a new runway, a new headquarters building is under construction and other recent improvements to its infrastructure should help its score, she added. A preferred location and “reasonable alternatives” for Base 1 are scheduled to be announced this spring, and the final decision is expected in spring 2014. The listing of Fairchild brought cheers from members of the Washington delegation heavily involved in pushing for the base. They sent letters in 2011 and 2012 to U.S. Air Force Secretary Michael Donley, highlighting the benefits of basing the tankers in Spokane, including the fact that the nation has invested more than $400 million in base infrastructure over the past several decades, they said. In a statement, Cantwell called the listing a major step forward. “We worked hard to get the KC-46A tanker built here in Washington state, and we’ll continue to work to make sure the tankers are stationed here in the Inland Northwest,” she said. Originally built as a repair depot for bombers during World War II, Fairchild has had tankers for more than 50 years. Initially they were stationed along with the B-52 bombers on strategic nuclear alert. When the bombers were moved elsewhere in 1994, Fairchild became the nation’s largest tanker base with both active-duty and Air National Guard wings. Recently, it became one of the first bases at which active-duty Air Force and Air National Guard units share planes in a partnership arrangement. Under the plans announced Wednesday, the Air Force will select either Altus or McConnell AFB as a school or training facility for crews learning to fly the new plane. The base that’s chosen for the school will not be eligible to be the first operating base. The KC-135 was designed in the 1950s on the same airframe as a Boeing 707 commercial jetliner, and it has been upgraded throughout its time in the Air Force fleet. Members of the Washington delegation began working in 2001 to replace it with a military version of the Boeing 767 and bring the first new planes, and a training facility, to Fairchild. The first proposal to lease the new planes from Boeing foundered when some members of Congress objected to the cost and a Boeing executive and a top Air Force official were involved in a contract scandal. At one point, Boeing lost a contract competition to Airbus, but a Pentagon check of that decision showed flaws in the Air Force’s decision, and Boeing won the second go-round. 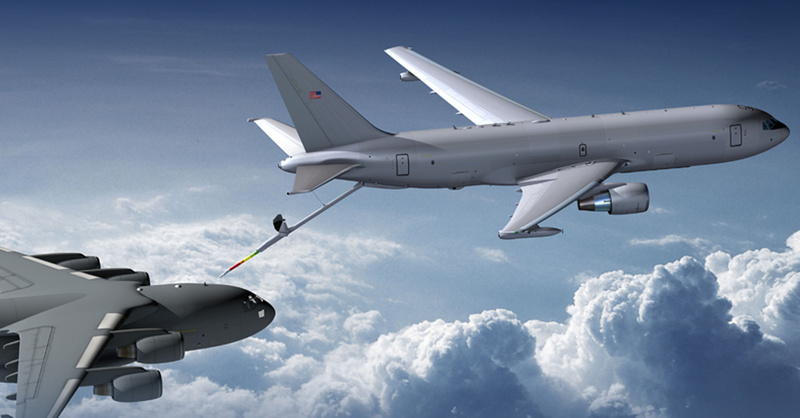 Boeing will build a total of 179 KC-46A tankers through 2028, with the first ones expected to be available by 2016. Staff writer Mike Prager contributed to this report.